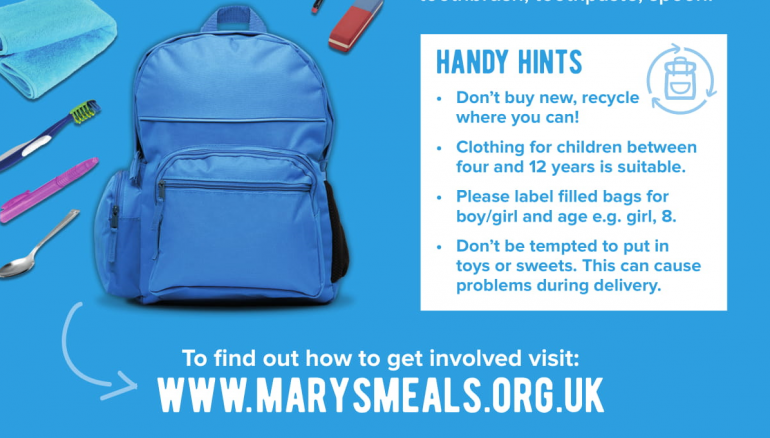 Mary’s Meals is a Scottish charity started in 2002. That year 200 children were being fed one good meal every school day in a place of education, we are now doing this for just over 1.4 million children! We work in 18 countries and feed around 30% of all primary school children in Malawi and Liberia. Whilst 99% of what we do is feeding young children at school, we also do one other amazing project – The Backpack Project. All these items (except Soap, Toothbrush and Toothpaste) can be recycled. Each bag needs to be labelled for a boy/girl and their age (between the ages of 4-12). please don’t be tempted to put in anything extra e.g sweets as this causes problems at customs. 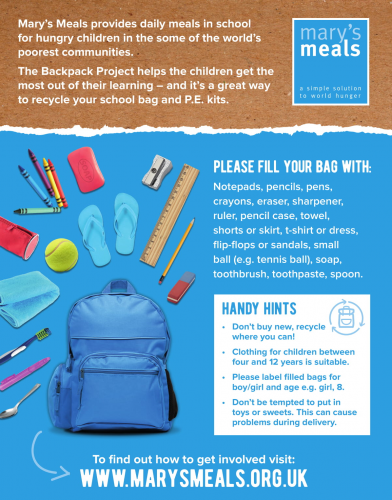 Once a minimum of 5 backpacks have been filled please contact us to arrange your collection. We will then send you some large white sack(s) along with instructions on how to get the white sack(s) picked up. We send back packs up to our central depot in Scotland from Heathrow Airport so wherever you are based, please contact us to find out how to get your back packs to us. *If there are less than 5 backpacks you will have to send them up to Scotland direct which will be more costly. In such cases you might want to link up with others involved in this project in order to make the minimum number.